I am directed to forward herewith the revised ‘Guidelines for Transfer’ to regulate transfer of Group ‘C’ officials, Group `13′ (non-gazetted) officials and Assistant Superintendent of Posts (Group `B’ Gazetted). These guidelines will supersede earlier guidelines circulated with communication no. 141-141/2013-SPB-I1 dated 31.01.2014. As a general rule, no official shall be transferred from one unit to another, either within the same Circle, or to another Circle unless he has completed probation period satisfactorily. Transfer of an official when requested for own convenience, shall not be discouraged if they can be made without adversely affecting to the rights of others. As it is not possible to accommodate an official borne on one gradation list into another gradation list without adversely affecting to the interest of other members in that gradation list, such transfers shall not ordinarily be allowed except by way of mutual exchange. Transfer by way of mutual exchange may be allowed if all other conditions of these guidelines are fulfilled. But in order to safeguard the rights of employees borne in the gradation lists of both the offices, the official brought in shall take the place, in the new gradation list; that would have been assigned to him had he been originally recruited in that unit or the place vacated by the official with whom he exchanges appointment, whichever is the lower. 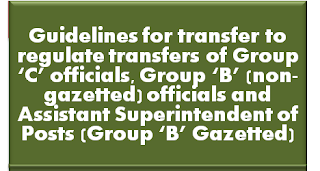 When an official is transferred at his own request but without arranging for mutual exchange, he shall rank junior in the gradation list of the new unit to all officials of that unit on the date on which the transfer order is issued, including also all persons who have been approved for appointment to that grades as on that date. If the old and the new unit form parts of a wider unit for the purpose of promotion to a higher cadre, the transferee (whether by mutual exchange or otherwise) will retain his original seniority in the gradation list of the wider unit. An official transferred from one unit to another will be allowed to seek re-transfer to his/her old unit. However, such cases shall be considered as a fresh transfer case under Rule 38 subject to all other provisions of these guidelines. To remove any doubt it is hereby clarified that an official on transfer to an unit from where he/she was transferred earlier shall not claim the seniority in the old unit before such initial transfer. Any special privilege to which an official would have been entitled by virtue of his position in the gradation list of the unit from which he is transferred will be forfeited on his transfer to a new gradation list. Transfer under Rule 38 shall be permitted only against similar type/categories vacancy i.e. Direct Recruit shall be transferred against Direct Recruitment vacancy and promote against a promotion vacancy. Further Unreserved (UR) candidate shall be transferred against UR vacancy, SC candidate against SC vacancy and ST candidate against ST vacancy. Under Rule 38, inter-Circle and intra-Circle transfer from one distinct cadre to another viz. Post Offices to Circle Office, Regional Office, SBCO, Postal Assistant to Sorting Assistant etc. or vice versa shall not be allowed. Under Rule 38, an official will be eligible for two Inter-Circle transfer and two lntra­Circle (i.e. Inter-region/Intra region) transfer during entire service. One additional chance for transfer in both the categories, viz. Inter-Circle and Intra­Circle, will be allowed to Persons with Disabilities (PwD). Employee with disability who has been appointed without availing relaxed standard of merit for PH candidates or an employee who suffered disability after initial employment, shall be allowed transfer as of a PwD candidate, subject to submission of appropriate certificate as per Government of India’s instructions in support of claim of being. An Assistant Superintendent of Posts shall not be transferred under rule 38 to a Circle where all his seniors in the grade of Inspector Posts are not promoted to Assistant Superintendent of Posts, excluding those who have not been promoted due to disciplinary action or who have denied promotion. Inter-Circle CPMG of both Circles. An application for inter-circle/inter-region transfer shall be addressed to the CPMG of the Circle where the official is working. Application for intra-region transfer shall be addressed to the PMG. Advance copy of application should not be sent to the authority where transfer is sought. As and when an application for transfer is received, it shall be recorded in the outward transfer request register, in order of date of receipt of such application by the competent authority i.e. CPMG/PMG. Similarly as and when communication of inward transfer seeking consent therefor is received it shall be recorded in the inward transfer register in order of date of receipt of such communication. Authority competent to allow transfer under Rule 38 shall strictly adhere to the order of requests received. On receipt of a transfer request, the office of the competent authority, viz. CPMG/PMG, shall seek views of the controlling officer of the official at the earliest but not later than 30 days from receipt of application, who shall send his views within 15 days, failing which it shall be presumed that the controlling officer has no objection to the transfer request. After considering the report, if any, of the controlling officer, the Competent Authority shall seek consent of CPMG of other Circle in case of Inter-Circle transfer/PMG in case of Intra-Circle transfer/Divisional Head in case of Intra-region transfer. Such authority shall convey their consent or otherwise within 30 days, failing which, it shall be presumed that the authority has agreed to allow inward transfer of the official. Where a request for transfer is not agreed to, the reasons thereof, shall be communicated to the official immediately. All Circles/Regions shall initially upload Inward and Outward transfer register on India Post website within 60 days of issuing of these guidelines and shall update it on quaterly basis. Before announcing vacancies for a particular recruitment year whether under Direct Recruitment, Departmental examination or promotion, request received under Rule 38 shall be considered in first instance. Only after considering all such requests, vacancies shall be announced. Transfer case shall be considered only in the month of December. Request for temporary inter-Circle transfer. Temporary inter-circle transfer shall be approved only by the Directorate on the recommendation of both CPMsG. The parent Circle of the official shall forward the proposal to the Directorate inter alia including the recommendation of the other Circle. The Circles shall not entertain requests for inter-Circle transfer on temporary basis in a routine manner. Such requests shall be considered by the Circles in the first instance under Rule 38 of Postal Manual Volume IV and instructions issued by the Directorate from time to time, if they are otherwise eligible. If the case is not considered under Rule 38, the reasons therefor may be recorded. Such inter-Circle transfer cases of officials on temporary basis, referred to Directorate, will be considered only when both the CPMsG of the Circles have agreed to in deserving cases after the genuineness of ground for such transfer stated by the official is established. Inter-Circle transfer on temporary basis shall be available to only those officials, who have completed probation period, wherever applicable, and in other cases on completion of two years of service in the grade. Temporary transfer shall be allowed to an official for a maximum period of three years, in the entire service, in one spell or two spells. However, there shall be a minimum gap of 3 years between two spells of temporary transfer. Grant of temporary transfer from one Circle to another will be considered by the Directorate initially for a period of one year only on recommendations of the CPMsG concerned. Extension of temporary transfer beyond one year may be sent to the Directorate by the borrowing Circle with the consent of parent Circle atleast 45 days before completion of approved period. Inter-Circle transfer on temporary basis from one cadre to another cadre, e.g. Postal Assistant to Sorting Assistant etc. shall not be permissible. Circles should not forward such request to the Directorate. If the official is promoted during the period of temporary transfer, such official shall be relieved immediately but not later than one month to join the promoted post, failing which, he/she shall be debarred for promotion for one year. Requests of temporary transfers and extension thereof already granted to the officials by the Directorate before issue of these guidelines will also be regulated s per these new guidelines. Post tenure of an employee shall be 3 years and station tenure shall be 6 years. Provided that an employee may be transferred before completion of post/station tenure on administrative grounds for reasons to be recorded in writing by an authority who is superior to the authority competent to order such transfer. The Authority Competent to approve the rotational transfer in normal course will initiate the proposal with proper justification for approval of the Superior Authority. Matching of human resource with requirements of posts and placing officials in the choice stations may be considered in the overall context of administrative requirement and austerity measures. Each Circle shall publish schedule, cut-off date etc. of rotational transfer immediately after circulation of these guidelines but not later than 30 days keeping in view the academic sessions prevailing in the particular Circle or State. Schedule once published shall not be changed subsequently under any circumstances. All such officials who are due for rotational transfer on completion of post tenure/station tenure shall be asked to give at least three options of the place of posting/station with reasons to enable the authorities to consider the same while effecting transfer. However, such request shall be considered subject to administrative convenience and availability of post. On completion of post-tenure of three years, to the extent possible, all officials will be posted in same station. Where it is not possible to do so without shifting some of them outside their present stations, they may be posted outside their present stations to the extent administratively feasible. In respect of cities where the whole city forms a Postal Region, on completion of station tenure of six year, a Circle cadre official shall be transferred out of the Division where he is working. In other words, a division within such Postal Region shall compute as a station for Circle cadre officials. If officials belonging to various cadres are waiting since long for their posting to particular stations and it has not been found possible to accede to their request for one reason or other, such pending requests for transfer may be acceded to in really deserving cases by transferring out officials having longest stay in such stations. The Divisional Head will satisfy himself/herself about the antecedents and character of the officials for whom the provision are being relaxed and note to this effect will be given in the file. No official will be posted back to the same single single-handed/double handed post offices on transfer/deputation or otherwise before a break of full tenure period. Information about cases of relaxation so exercised by the Divisional Head will be communicated to the Regional Postmaster General/Chief Postmaster General as the case may be, in a half yearly statement. Rotational Transfer of officials working in Saving Bank Control Organization shall be made within the cluster of Divisions. However, in exceptional circumstances, DPS (Hqs.) in consultation with Accounts Officer ICO (SB) may consider movement of SBCO officials outside the cluster. Extension of post tenure in respect of all Group ‘C’ staff, other than Sub Postmaster/Postal Assistant in a single handed or double handed Post Offices, may be allowed in deserving cases for a period of one year by the Regional Postmasters General/ Chief PMG after recording full justification on file. Such extensions to Group ‘B’ officials shall be granted by the Head of the Circle after due consideration. In no case, post tenure of an official shall be extended beyond one year. An Official on his transfer, after joining the station assigned to him, shall not be considered for retransfer for a period of two years to the station from which he was Two year break is; however, only a minimum condition and it will not entitle an officer/official to claim retransfer to the old station in preference to others who have spent longer period out-side. Retransfer before completion of two years may be considered only in extreme public interest or on extreme compassionate grounds in exceptional cases with the approval of the Heads of the Circle. The transfer/posting/retransfer of officials as Sub Postmaster/Postal Assistant in a single handed or double handed Post Offices shall be regulated as per the instructions issued by Investigation Division of the Directorate, in this regard. Postman and Multi-Tasking Staff are exempted from rotational transfer except on administrative grounds. Head of Circles shall formulate and circulate policy regarding beat rotation of Postman. Where spouse of an employee is working, guidelines issued by Department of Personnel & Training regarding posting of husband and wife at same station shall be taken into account while implementing rotational transfer guidelines. For employees having differently abled dependents, guidelines issued by Department of Personnel & Training regarding posting of Government employees who have differently abled dependents shall be taken into account while implementing transfer guidelines. Rotational Transfer order shall be implemented within 45 days of its issue. When orders are not implemented within 45 days, Circle shall report such instances to the Directorate with reasons and officer/official responsible for non- implementation of the transfer orders within stipulated time. New products/services and modern technology are being introduced in the Department of Posts in a big way. Heads of Circles/Regional Heads/Divisional Heads/Unit Heads therefore, should build up a pool of trained officials to handle these new products and technology related jobs so that manpower is readily available to replace the officials presently working on completion of tenure and to ensure achievement of desired objectives. Proper succession planning will have to be made by the HOCs/Regional/Divisional/Unit Heads well in time. The Department has already taken necessary steps to train its manpower for successful implementation of IT Project. It should not be difficult to replace such officials on completion of tenure. As such, the competent authority should ensure transfer of such staff on completion of post tenure/station tenure. It may be ensured that women employees are posted/transferred to an office only after ensuring that basic and essential amenities for women as required are available there. Provisions of these guidelines are in addition to the provisions of Postal Manual Volume IV and therefore provisions of Postal Manual Volume IV which are not incorporated here shall continue to prevail. In case of conflict between any provision of the Postal Manual Volume IV and these guidelines, relevant provision of these guidelines shall prevail and the provision of the Postal Manual shall be deemed to be modified. Bringing of direct or indirect political or other outside influence regarding posting/transfer would attract the provisions of Rule 20 of CCS (Conduct) Rules, 1964, as per which an appropriate disciplinary action may be initiated against the official/officer.